Ethel Edith Mannin was born in London to Irish parents. She was well-educated and travelled wideley in Europe, Asia, and the Middle East. She joined the women’s suffrage movement and the Independent Labour Party. She married twice: in 1919, she had a short-lived union which produced a daughter, and in 1938 to Reginald Reynolds, a Quaker writer. In 1934-1935, she was involved in an intense but difficult relationship with W.B. Yeats, who was on the rebound from Margot Ruddock. She also had a well-publicized affair with Bertrand Russell. Ethel Mannin was a prolific writer who published more than three dozen novels, of which the best known were Venetian Blinds (1914) and Red Rose (1941), based on the life of Emma Goldman, her political colleague at the time of the Spanish Civil War. 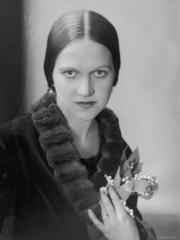 Ethel Mannin also wrote her autobiography and numerous nonfiction works, including Women and the Revolution (1938) and A Lance For the Arabs (1963). Ethel Mannin is currently considered a "single author." If one or more works are by a distinct, homonymous authors, go ahead and split the author. Ethel Mannin is composed of 6 names. You can examine and separate out names.